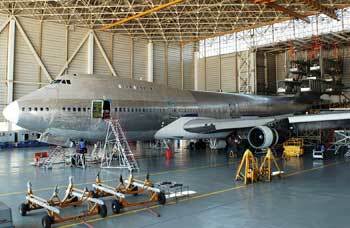 The aerospace industry uses a variety of tools, techniques, and equipment for surface finishing and parts deburring. Examples include vibratory finishing and shot peening. For cylinder deburring and final surface finishing, aerospace manufacturers choose Flex-Hone® technology from Brush Research Manufacturing (BRM). This flexible, resilient honing tool features abrasive globules laminated to flexible nylon filaments, and is ideal for hydraulic components with demanding surface finish requirements. Cylinder-shaped components like the ones used in aerospace hydraulics need a smooth, burr-free finish for reduced friction and wear, optimum lubrication, and dependable power transmission. The BRM Flex-Hone® imparts a substantially smooth surface finish while removing burrs and rounding metal edges. This non-directional or cross-hatch pattern also aids in oil retention. Flexible honing is designed for surface improvement rather than heavy-duty material removal, and leaves cylinder bores at the precise dimensions required. BRM Flex-Hone® tools are available in a wide range of standard diameters (4mm to 36 inches) and in 11 different grit sizes and 9 abrasive types, including diamond abrasive for harder materials such as aerospace alloys. In addition, Brush Research Manufacturing can develop custom Flex-Hone® tools for aerospace hydraulics and other applications. As the following example shows, flexible cylinder honing solved a surface finishing and deburring challenge involving hydraulic control mechanisms. When an aerospace company needed to solve a complex finishing challenge with hydraulic components, BRM developed a custom Flex-Hone® tool that met all of the manufacturer’s requirements. The low-volume, high-value hydraulic control mechanisms that the California company produced needed a burr-free finish at the intersection of the sealing lands and relief grooves. Yet the project’s surface finishing and deburring requirements didn’t end there. Two specifications were particularly noteworthy. First, burr removal could not produce an excessive radius at the land edge. Second, deburring the intersections between the sealing lands and the relief grooves could not degrade the sealing surface or alter the inside diameter (ID). The key to addressing both challenges was a custom Flex-Hone® tool with a larger tool diameter and a reduced number of globules in 800-grit silicone carbide abrasive. In addition to consistent burr removal and edge radiusing, this special Flex-Hone® tool also improved the sealing lands. BRM Flex-Hone® tools have also been used to solve surface finishing and deburring challenges with hydraulic swivel components with high-stress edges between a countersink and a bore. Additional aerospace-related applications include aircraft engine components and helicopter rotor drive shafts. Flexible cylinder hones have also been used with the U.S. Navy’s Quality Hole program. To learn more about Flex-Hone® technology for the aerospace industry, download BRM’s Future in Finishing White paper.